Things have taken a strange turn in the locked off wings of an abandoned hospital. A mad scientist and his hoard of undead guard their territory within the gothic halls. Outside an ominous sky of thunder, rain and lightning blankets the surrounding woods. Once again, you'll have to craft, fight and scheme your way to freedom from this eerie supernatural slammer. 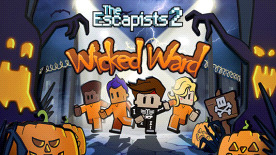 Requires The Escapists 2 (base game) to use this DLC.